This Saturday, 1st September, marks the return of Cage Warriors to their spiritual home, the Echo Arena in Liverpool for Cage Warriors 96: Pimblett Vs. Bak. Paddy ‘The Baddy’ Pimblett and Soren ‘True Viking’ Bak go head to head for the vacant Cage Warriors lightweight crown. The main card will be featured on BT Sport 2 and UFC Fight Pass. Pimblett(14-2) bounced back from defeat by Nad Narimani with an incredible flying triangle submission win over Alex Savvidis in the Echo arena at Cage Warriors 90 in February. 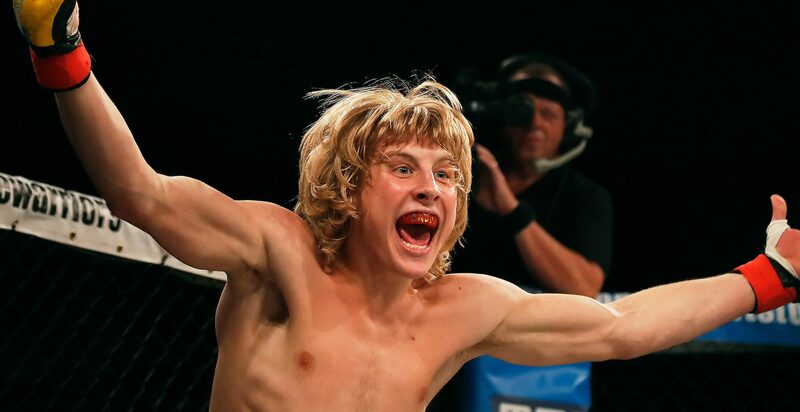 Pimblett seemed destined for a UFC move before the loss to Narimani and would be well placed to put himself in the picture again with a victory over the dangerous Nordic 155er Bak. Bak (11-1) is riding a 3 fight win streak following his switch to Cage Warriors, two of them coming by way of submission. The Dane’s only loss coming against Finn Alexsi Mantkivi by TKO in the first round in October 2016 in EuroFC’s inaugural show. Mantykivi now fights in Cage Warriors and comes up against Jack Grant on the main card of the show two before the main event. Bak peppered Jacobsen with some slick stand up strikes before eventually getting the victory with an Arm Triangle choke at the end of the second round and looks a really intriguing prospect who seems to improve on every outing. Prediction: The bookies have these two neck and neck for good reason, this is a very tough one to call. Pimblett showed against Julian Erosa and indeed Nad Narimani he has the ability to rise to a difficult challenge, Bak will give him similar problems that he faced against Julian Erosa. Though Bak hasn’t the KO CV Erosa boasts, this is a weight class up for Pimblett, who was discouraged from remaining at Featherweight following a series of gruelling cuts. Bak hasn’t faced the same level of competition that Pimblett has and this will be a great yardstick as to the ‘True Viking’s’ level and potential going forward. I see Paddy edging this by decision but being pushed close, with a submission scare or two on the way possibly. Lee ‘The Butcher’ Chadwick (24-13-1) defends his Cage Warriors Middleweight crown against Jonas Billstein (19-5-1) in the co-main event. The Scouser is undefeated in 3 bouts since his return to Cage Warriors. Billstein makes his Cage Warriors debut having last fought Mattia Schiavolin in Vennator FC, the bout ending in a majority draw. Prediction: The home favourite Chadwick has never shirked a challenge, having previously fought Chris Fields, Jack Marshman and Victor Cheng. Billstein has notable wins in ACB against Alexey Butorin and Grachik Bozinyan. He has strong wrestling and groundwork that saw him choke out both men in ACB. I can see this being a frustrating encounter for Chadwick, he is incredibly strong with excellent clinch control, his best chance of getting a finish would be on the feet with those heavy hands. Billstein will use his wrestling to take the fight to the ground where I feel he will finish Chadwick within the distance by a late submission. Grimsby lightweight Jack Grant looks to extend his 5 fight win streak against Finn Alexsi Mantykivi, who himself is riding a 2 fight win streak coming into his Cage Warriors debut, one of those over main event man Soren Bak as previously mentioned. Grant has regrouped and grown incredibly over the past couple of years after two losses scuppered his momentum in late 2015 and 2016. Mantykivi went from that Bak triumph to beat Bashier Gagiev, who early in his career has a mixed record of 4-3. This will be another step back up for Mantyviki against a man brimming with confidence in Grant. Prediction: Both men possess knock out power and have variety in their finishes with submissions too. The winner of this fight would be knocking on the door of the winner of the main event for a title fight. Grant has the momentum behind him to take it to Mantyviki, the Finn will be eager to impress in his new promotional home but it seems the wrong time to fight Grant. Grant to win by decision in an exciting three rounds of action. The main card opens with the return of former Cage Warriors welterweight champion Nicolas ‘Locomotivo’ Dalby, who not long ago drew with UFC Welterweight Title contender and Liverpool homeboy Darren Till. He has however lost his previous two fights. Dalby will take on undefeated Italian prospect Roberto ‘Minotauro’ Allegretti. Allegretti is making a big leap to fight Dalby in only his 4th pro fight. Prediction: It is always difficult for a fighter who is cut by the UFC to come back to a promotion they reigned as champion in, going from drawing with Till to losing to Peter Sabotta will have hurt Dalby. He will be aiming to redress the wrongs of his last fight and set his sights on the Cage Warriors Welterweight title once again. Having only seen two youtube videos of Allegretti it is difficult to come to a conclusion as to his ability. For this reason I am backing Dalby to return to the win column by decision. Allegretti is durable, his last fight went the distance and he was tested, but at 38 without the experience Dalby possesses I can’t see him getting the victory unless we are witnessing Dalby’s decline as a high level fighter.